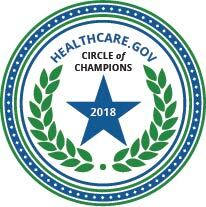 Evergreen Park, IL - Butch Zemar, Healthcare Reform Specialist and Author, was presented with the Circle of Champions on September 27, 2018, for outstanding ongoing contribution and success during the 2018 Health Insurance Marketplace Open Enrollment Period from the Health Insurance Marketplace (CMS). Zemar shares this success with only the elite professionals in the insurance industry. The Health Insurance Marketplace was put in place in 2014 to help consumers shop for health insurance and potentially receive a healthcare tax subsidy from the government. Insurance brokers provide guidance and expertise to assist individuals, families, and businesses in gaining the right insurance product that they can afford. “It is an honor to share the Circle of Champions recognition with the top professionals in the industry. We work hard every day for our clients, and they appreciate what we put into our craft”, says Zemar. The National Open Enrollment begins on November 1, 2018, and it will end December 15, 2018, for most policyholders looking to review their coverage going into 2019. The open enrollment is the timeframe that individuals, families, and businesses need to review their insurances to make sure they are gaining the most out of their healthcare. Be sure to contact an insurance professional. Butch Zemar is a Healthcare Reform Specialist and Author. He helps business owners and their employees with insurance solutions that make sense and control the costs. Zemar is one of the top professionals in his field in the Chicagoland area. He has been recognized on a national level, won awards and has authored publications.